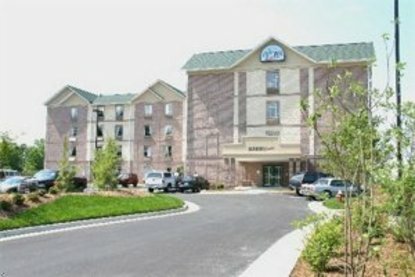 The Savannah Suites Denver NW, located minutes from both downtown Denver and Boulder, is conveniently located just off I-76 in Arvada, Colorado. Jefferson County Airport, Denver International Airport, dozens of major corporations, abundant shopping, and many local ski areas are also easily accessible - making our friendly extended stay hotel the perfect spot for business or vacation travel. Our warmly-appointed guestrooms feature all the comforts of home and a long list of amenities, including complimentary high-speed internet access, 27 inch tv with satellite, iron and ironing board, full kitchen which include a refrigerator, microwave, 2 burner stovetop, coffee maker and all the extras you will need to cook and serve dinner such as pots, pans, cups, plates, and utensils. Some rooms include panoramic Rocky Mountain views. Our central location puts you close to everything Colorado has to offer. Local destinations like the Pepsi Center, Coors Field, Mile High Stadium, Denver Zoo and the Denver Performing Arts Center are a short drive. Whether you are visiting the Arvada area for business, pleasure, weekend getaway or ski trip, our caring, professional staff welcomes you to Arvada There is a 2.00USD service fee per night.